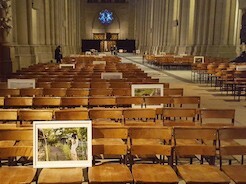 On March 11, 2017, Remembering Fukushima: Art and Conversation at the Cathedral commemorated the sixth anniversary of the Fukushima Nuclear Disaster in Japan. 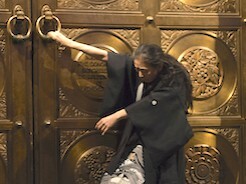 Conceived and directed by the Cathedral’s artist-in-residence, Eiko Otake, this four-hour program brought together scholars, specialists, and artists of many disciplines to create an occasion that aimed to be both informative and affecting. Eiko dedicated the four-hour event to atomic bomb survivor, writer, and close friend, Kyoko Hayashi, who passed away on February 19, 2017. 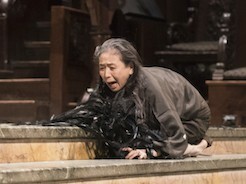 Read Eiko's dedication of the event. 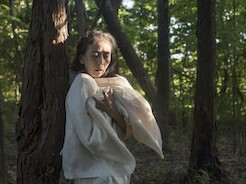 The event also coincided with the closing of The Christa Project, which featured 21 contemporary artists and included Eiko and Johnston’s photos from their most recent trip to Fukushima. 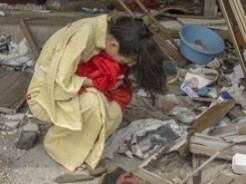 On March 11th, Eiko and Johnston’s photo exhibition was expanded to mark the occasion. Speakers, musicians, and artists worked together to create an experience that allowed participants to know and remember Fukushima, and its significance in our lives today. Thanks to many people's help, and the preview articles below, the event was attended by close to 1000 people in total. A few hundreds people stayed throughout the four hours. I am deeply grateful that so many people showed up and stayed for many hours. Many friends shared their knowledge and art. University professors, Marilyn Ivy, Thomas Looser, and Katja Kolcio were heartfelt conversationalists with William Johnston and me. Bill showed both his photographer-self and his historian-self by giving a concise talk on what happened and is happening in Fukushima. High school teacher Nathan Snyder shared his passion in teaching an intense nuclear proliferation course and videos of his classroom and his students' works. His students led the participants in a ritual of placing paper cranes onto the stage. Jake Price's videos and talks were eerily haunting but beautiful and the sound bites Alexis made from Fairewinds Energy Education podcasts sent chills to all listening. When organist Ronald Ebrecht played, the Cathedral vibrated. And John Kelly, Carol Lipnik, and Geo Wyeth sang and performed their hearts out. Ralph Samuelson and Elizabeth Brown played shakuhachi as if calming the upset, while I recited in Japanese the poems written by the people of Fukushima and my son Shin Otake recited them in English. My assistants and collaborators, Mark McCloughan, Alexis Moh, Megumu Tagami, and Nora Thompson, who have been supporting my solo project. 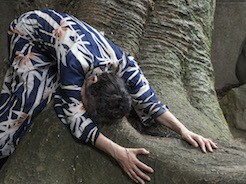 Remembering Fukushima was presented in association with Asia Society and Danspace Project. 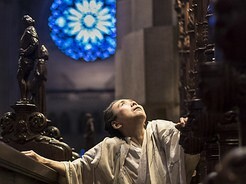 Eiko’s residency at the Cathedral and her participation in The Christa Project was made possible in part by support from the Japan Foundation’s Performing Arts Japan program, the New York State Council on the Arts, and the Harkness Foundation for Dance.